We are so thrilled to have the amazing @Gesineruns partnering with Phoebe Rose Rocks this year! 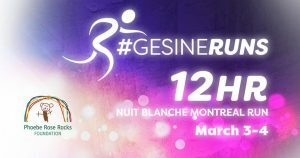 Gesine will be hosting a series of events leading up to her 200km run this summer from Montreal to Ottawa to raise awareness and funds for childhood cancer research! Thank you to Cafe Vito for keeping the runners fed & caffeinated!